Sentencing was delayed after the judge learned that the renegade builder was planning to tear down the code-violating structures. 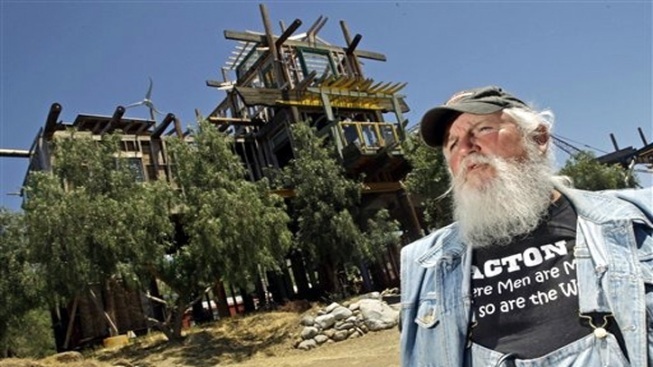 The renegade builder who assembled a hodge-podge known as "Phonehenge West" in the Mojave Desert may avoid jail if he follows through on plans to tear down the stucture. Kim Fahey was convicted of building code violations in June after a long-running battle over the residence-turned-roadside-attraction in Acton. Sentencing was scheduled for Friday in Superior Court in Lancaster, and Fahey could receive as much as a year in jail on each count -- about a dozen -- or just probation. But a judge delayed the hearing until September after learning that Fahey planned to tear down the buildings. Judge Daviann L. Mitchel said that makes a community service sentence more likely. Sentencing was delayed until Sept. 23. The 1.7-acre property consists of 12 structures, including a 70-foot tower, that were constructed primarily out of scrap materials and utility poles. Some of the structures are linked by ramps and bridges that lead to patios. Fahey built the structure over the past 30 years and lived there with eight others. He moved off the property after the conviction and began dismantling his life's work. Alan Kimble Fahey says it was fun to build and if he has to take it down, that will be fun, too. Authorities call it a safety hazard that should be torn down. In an interview with NBC4, Fahey called it, "A museum, a library and a fun place to hang out." "They could take this down the bare ground, pack everything into a missile and fire it into the sun," he said in an interview earlier this year with NBC4. "They can't take away 30 years of what a blast we've had here doing whatever we wanted." During trial testimony, which lasted a week, authorities said they visited his property several times between 1986 and 1995 and again in 2006 and 2007. They said they issued citations and stop-work orders but that he ignored them. Fahey said he initially tried to work with building inspectors but that they repeatedly demanded changes, lost his plans at one point and quit contacting him for several years while he continued to build.